Ludhiana is a city and a municipal corporation in Ludhiana district, Punjab India. The city is well connected to all major cities of India by road, air, and rail. The Delhi-Amritsar route (on main) and is a crucial railway junction. The lines go straight to Ferozepur, Jalandhar, Dhuri, and Delhi. The city is connected well with daily or weekly trains to major cities of India and almost all other places including Amritsar, Jammu, Jalandhar, Pathankot, Kanpur, Patiala, Delhi, Mumbai, and Kolkata. Presently, the train station is under Ferozepur Railway Division. The railway line between Ludhiana and Chandigarh was inaugurated in 2013. The government has passed a dedicated cargo track between Ludhiana and Kolkata. Ludhiana is a beautiful city and home to a number of places of tourist interest that draws in a huge number of tourists from different parts of India. The tourism industry in Ludhiana is flourishing and has been gaining immense popularity. It has turned into a crucial stopover in Punjab tour list. With a huge number of sacred shrines, temples, and Gurudwaras located all over the city, it has become an important pilgrimage site for tourists from all over the country. The Lodhi Fort built by Sikander Lodhi is the major attraction of the city. It is 500 year old fort located near the Sutlej River. One must also visit the Maharaja Ranjit Singh Museum on their tour to Ludhiana. Some of the best places to travel here include Ansal Plaza, Baba Gajjuji Thapar Shrine, Gurdwara Damdama Sahib, Battle of Aliwal - A War Memorial, Dukh Niwaran Sahib Gurudwara, Bhaini Sahib (Bhaini Ala), Christ King Church, Bilwanwali Masjid, Patshahi Chhevin, Bhirvisit Budha Nallah, Degsar Sahib Gurudwara, Chhapar Fair, Gurdwara Charan Kanwal Sahib and many more. Hiring a taxi in Ludhiana will help you enjoy the tour in Punjab and areas around better. If you have planned a trip to Ludhiana; get in touch with us for an amazing travel experience. 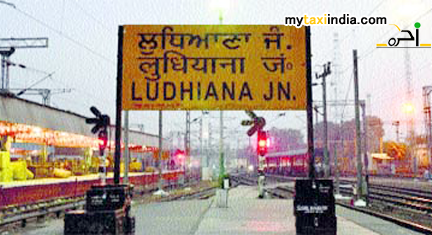 Serving as a leading car hire, railway, and airport transfer service provider, we invite you to experience a never before tour experience to Ludhiana. With us, you can expect completely secure, enjoyable, and hassle free tour. My Taxi India aims towards ensuring proficiency and comfort to esteemed clientele and potential customers. We are backed by a dedicated team of customer care professionals and engineers who will take care of all your tour based requirements. We undertake extreme pride in claiming unparalleled car hire and airport transfer services at competitive rates. To experience the best in the industry, book a taxi with MY Taxi India. Bon Voyage!